First, install the SQL drivers and the AWS Schema Conversion Tool (AWS SCT) on your local computer. 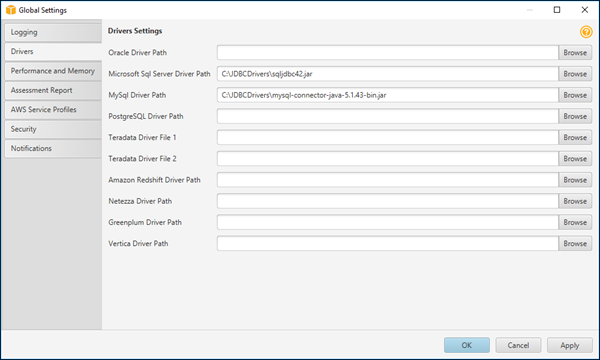 Download the JDBC driver for Microsoft SQL Server. Download the JDBC driver for Aurora MySQL. Amazon Aurora MySQL uses the MySQL driver. Install AWS SCT and the required JDBC drivers. See Installing and Updating the AWS Schema Conversion Tool in the AWS Schema Conversion Tool User Guide, and choose the appropriate link to download the AWS SCT. Start AWS SCT, and choose Settings, Global Settings. In Global Settings, choose Drivers, and then choose Browse for Microsoft Sql Server Driver Path. Locate the JDBC driver for SQL Server, and choose OK. Choose Browse for MySql Driver Path. Locate the JDBC driver you downloaded for Aurora MySQL, and choose OK. Choose OK to close the Global Settings dialog box.